pseudoparanormal: Nostradamus - Astrologer, Psychic, or Both? In Chapter 7.1 "Cognition" of Timothy Lawson's "Scientific Perspectives on Pseudoscience and the Paranormal" Michel Nostradamus is the focus. This 16th century French astrologer and physicist has been said to possess clairvoyance. 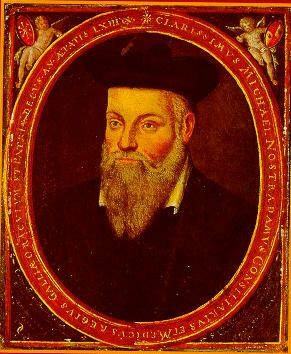 Nostradamus wrote a ten volume series called Centuries which contained 942 prophecies published in 1555. Although this prophecy may seem like it refers to September 11th in NYC, it is actually very vague. What are the "two great rocks"? Is that supposed to be the Twin Towers??? I had not idea what arethusa meant so I had to look up the definition. Apparently, arethusa was a wood nymph who was "changed into a fountain" by Artemis for protection from the river god Alpheus. So what arethusa has to do with September 11th, I really don't know. I must say that I am intrigued by Nostradamus' prophecies but I don't know if any are believable. Lawson explains how people use confirmation bias in order to find information that relate to major events happening in our lives.